As we wait and prepare for Christmas, anticipating the coming of Jesus into the world, I’ve been reflecting on what this time, these weeks before she delivered her child, were like for Mary. 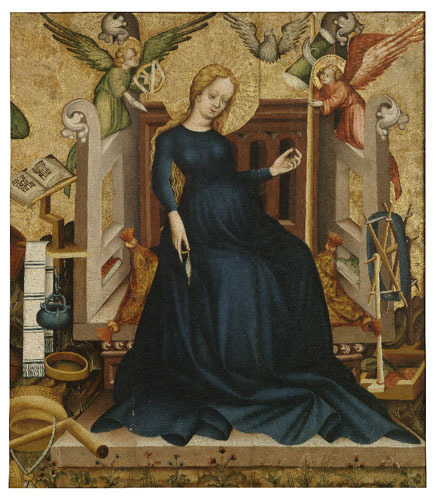 I can’t help but think that her experience of late pregnancy would not be completely unrecognizable from what we know today. She was free from sin certainly (and therefore the pains of childbirth), but not exempt from every other aspect of our human experience. She was a young woman very soon to become a mother. What were these final days like for her? Mary probably felt physically uncomfortable and unwieldy; the way her body moved unfamiliar and strange. Did she tire more easily? Did she feel emotional, sentimental? Did she think ahead to the years to come as her child grew, imagining how he would look, the sound of his voice? Did she and Joseph share a smile when they saw young boys playing in the street? Would she encourage Joseph to feel the baby move in her womb? Did she stop at moments during the day, hand on her belly, focusing on the child as he turned over or got the hiccoughs? Did Joseph rub her lower back for her or massage her feet? Would she be turning inward now, very aware of the life she carried under her heart, preparing for the moment to come when she would at last hold the infant in her arms? Like every mother, I’m sure she would have wanted to have her home ready for her child; hoped for wise and encouraging faces around her to help while delivering her child, and afterward as she became accustomed to new motherhood. Instead she found herself on the back of a donkey, leaving her home for a strange town, travelling dusty roads for a week or more, uncertain of having lodging when they finally arrived in Bethlehem. Was Mary overwhelmed or disappointed by her less than ideal circumstances? I don't think that was the case. In the first Advent, as throughout the rest of her life, Our Lady shows us it is possible to trust in God's Providence - even when we are asked to make a difficult journey, and even when there are no rooms at the inn. We have in her a perfect example of doing our duty of the moment with a joyful heart. Blessed Mother of the Christ Child, beloved mother of us all, you brought hope and salvation into the world through obedience and humility. Thank you for your Yes to God. Thank you for loving Our Lord as an infant, guiding Him as He grew into a man, and comforting Him in His suffering. We unite our hearts to yours in preparation for the coming of Jesus. By imitating your motherhood, may Christ be born anew in our hearts this Christmas. Amen. Thank you Tess for your wonderful and thoughtful reflection on Our Lady, it is a good reminder as we prepare for Christmas. We are so blessed to have a special mother! Great meditation Tess. You drive the point home that though we may be in awe when we contemplate Our Lady and the Saints, they were human also. They had the same anxieties, worries, hopes and fears that we all share. I remember when my firstborn came into the world and the day came to take him home and still, we had no crib for him. I had one on order and it had not arrived yet so I improvised. I emptied one of my dresser drawers, filled it with a thick folded blanket, placed it on a table next to my bed and laid my son in it. It worked perfectly but I remember asking myself what kind of a father could I be if I couldn't even provide a proper bed for my firstborn and it hit me hard. Then I think of Joseph and Mary, on the road, home left behind and their son about to be born...God improvised. I'm sure Mary and Joseph asked themselves the same question on that night: what kind of parents are we going to be if we cannot properly provide for him on his first day among us? The more things change the more they stay the same. Thanks Tess. Frances - thank you. And yes, Mary is a great gift to us, isn't she? I'm thinking about her a lot just now, the day after that unspeakable tragedy at the school in the US. Her mother's heart must be breaking for those poor families. OC - you proved yourself a good father right from the beginning. God provides what we need, doesn't He? Even a dresser drawer! I love the simplicity of that image, compared to the vast array of equipment that children seem to require today. What more do they need, really, than to be warm and safe and loved? I know you're embarking on a new stage of fatherhood now, and I pray it will be a time of great joy and blessing for you and your family.